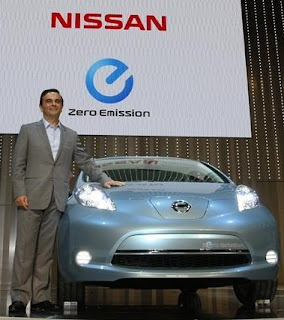 Nissan showed off their electric car, “Leaf”, during Japan’s auto show. It is a step toward its goal of leading the industry in the zero-emissions field. The Leaf has a top speed of over 76 mph and a cruising range of 100 miles - a distance that covers the needs of 80 percent of the world's drivers, according to Nissan. Nissan’s grand master plan is to sell Leaf cars in the US, Japan and Europe near the end of 2010, adding two more models soon after. It expects production to start around 200,000 units a year at the global roll out in 2012. So, who is right behind them? Manufacturers such as Toyota and Volkswagen have also announced plans to launch electric cars in the next several years, but they say it could take quite a while for the vehicles to gain momentum due to their high cost, limited driving range and long charging times with the current battery technology. Have you seen the movie "Who Killed the Electric Car?" It will not take decades; just more breaking down government barriers. There is too much money associated with the combustion engine and our society is ready and ripe for a shift. I like that this car is zero emissions, but until more electricity comes from renewable sources, the coal used to make the electricity has emissions. And in some parts of the country, where the coal has a lot of sulfur, the emissions are bad. I think they need to be more transparent about the actual environmental impact when they promote these products. In many ways the ability to reduce our dependency on foreign oil is as relevant an issue. Very good point! Many city mayors, who are part of the US Climate Protection Agreement, are taking on this challenge to promote carbon sequestration. Even bigger is the federal carbon credit exchange program (already accepted in Europe) that will help to tackle the issue of how electric vehicles still heavily rely on the coal-chain. Sure, it's better than foreign oil, but still a nasty, dirty resource.